Squash/Pumpkin and Watermelon blossom - is this female? ...what about this one with an odd squarish structure. Is this female too? Re: Squash blossom - is this female? The fruits at the base of females are usually fuzzy. Even pumpkins, and winter squash. It doesn't look too fuzzy. It's definitely a tough call! They look so boxy! That ones very young, too. My first inclination is male. Stout big strong male! Haha! But the fruit is boxy on that Dakota. I think in a day or so, you'll know either way. I changed my mind. I think it's a girl. the buttercup babies that I had , before the SWB got them, were kinda box shaped, unlike the yellows and zukes. I admit I don't know a lot about squash plants but I thought the males always came well before the females. Is that a long stem under it? I'm glad I don't have too many vine borers. Just fruit flies. males always came well before the females. Males are often on long stems and sit well above the canopy, where the females are on shorter stems and usually down under the canopy. Also the females have a nice ovary, that develops into the fruit later on. You don't see this on the males. Right. It's looking like it *is* female -- the closed flower petal has shriveled and was getting mushy on the still green boxy structure so I pulled it off -- it looks like it was pollinated. I can't wait to see what the final fruit looks like. It's one of the plants that didn't make it inside the protective tunnel though. So I'll have to keep a close eye on it for any sign of SVB's and squash bugs. Our severe cold winters are good for something I guess. I have never seen a squash vine borer. We do get the occasional squash bug, but seldom in any numbers to do much damage. The freezing ground seems to kill any eggs or pupae and the bugs have to move in from elsewhere and most years don't make it here. Since we are in a mountain valley, they have to come over a mountain to get here. I'm growing winter squash that are supposed to be SVB resistant in a separate area. Hopefully by next year, I can be as carefree about growing them. Your observation that males are higher above the canopy while females are closer to the ground under the canopy has been wonderfully helpful in quickly glancing in the tunnel for male and female blossoms. Today, I spotted the first female that looks like will open tomorrow almost immediately. I've never known squash flowers of either gender to rise above the canopy. Here they stay close to the base, and they are pretty easy to distinguish. Not my picture, but I know pattypan has a female that looks like a mini pattypan--not a circular base. I think all the different shapes are so intriguing. . I posted some pictures of different varieties of female blossoms that I think set fruit after hand pollinating. At least the pictured ones are getting bigger. As for male vs. female, so far, whether they are above the canopy or not, the males definitely have long slender stems and females have thicker shorter stems. 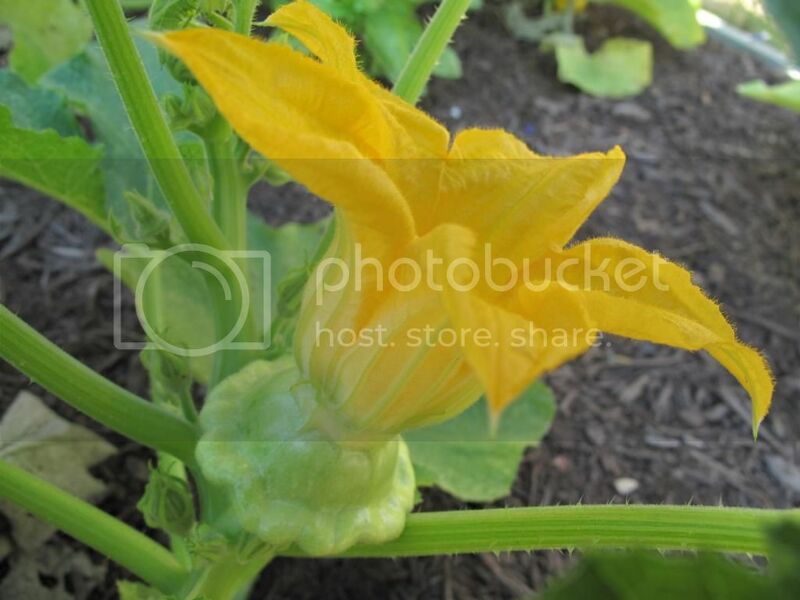 Re: Squash and watermelon blossom - is this female? I was having trouble finding female watermelon blossoms. Then. I thought about jal_ut's comment and looked to see if watermelon females also had short thick flower stalk. ...well no... Watermelon females, I discovered, have fancy curved pedestals that they perch on. The males all have boring straight stalks. Watermelon female flowers dying ?